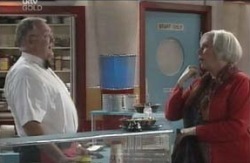 Dorothy Stevens suggests Harold look in her case and Joe reacts. Toadie tells Nina about the live gig. Nina is just finishing her song and the audience loves it. Susan discusses Nina's performance success with Libby, commenting that she's sure Karl would have also gone down as well, but Libby reminds her that among other things she said about the group, she renamed them 'The Defies Description'. Susan's just repeating her idea that she wanted to keep Karl in his place, when the phone rings. It's Ron, who tells Libby that the stud's doing well and their new-born first foal has been named after Drew. She shakily says it's a lovely gesture. Nina's being congratulated by the crowd, especially Lyn, Joe, Connor and Michelle. Just as they're deciding how to celebrate at the Scullys' house, Glenn Wheatley comes and tells Nina that if she's considering appointing representation, she should give him a call. Rosie and Harold have joined them for a celebratory drink. Rosie tells Harold he shouldn't pursue the dating agency just to reassure Lou. She doesn't seem very pleased when he says no, it's entirely for himself, as he has better things to do than worry about Lou's stupid insecurities. Lyn suddenly thinks he should have invited Nina's parents and Joe says there's still time to ring them, but Nina obviously really doesn't want them to and eventually has to say, to their surprise, that she just doesn't want her parents there. Lou and Rosie are having a drink together. He's talking about it being an ideal regular venue for Nina, but Rosie points out that she's a minor, it's a crucial time in her career and anyway she's now out of his league as Glenn Wheatley has offered to represent her. He accepts this but says 'this pub needs youth appeal'-before adding wryly 'according to your son. Well I'm just trying to think like my business partner'. She raises her glass slightly to that. 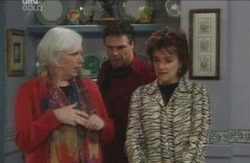 Lyn asks Joe what's wrong with Nina's parents. He thinks perhaps she feels she 'can't cut the mustard' in front of them! She comments that after last week happy chatty teenagers are music to her ears! Connor and Nina are a little embarrassed with one another when she thanks him for helping her. They talk briefly about Michelle's lack of finances for New York and Nina replies that she has a plan which may help. 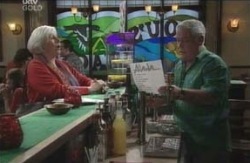 They ask Lou if they can hold a benefit for Michelle at the pub, where Nina would sing her new single. He jumps at the idea and immediately talks about 'spin-offs' and merchandising. Nina insists it's to help Michelle, not make money for them. Susan serves Ben and Libby and mentions that she's so happy because her therapist is pleased that she's recovering so much memory and everything seems to be getting back to normal. She's also excited that Karl's coming home the following night. Harold's on the phone, saying he doesn't want to try again as he just doesn't think he's the right type, but he accepts another name 'to be polite' as it's already organised. Rosie has overheard and knows he's been talking to the dating agency- she says he doesn't have to pretend with her, so he admits he'd actually rung to cancel and says this will be the last time. Michelle's freaking out at the idea of getting ready for the trip and Joe and Lyn are attempting to help her and get her to calm down. She's worried time's going too fast, so they tell her this sort of last-minute panic is common then remind her of her dreams of experiencing another country. Joe tells her that she'll get through any difficulties she meets at the start as she's a Scully and a tough kid. 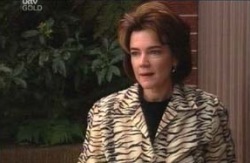 Susan tells Libby that she's organised a white MG to pick Karl up in and then plans to take him to a romantic French restaurant on the water. Harold meantime is anxious as he's due to go off to the meeting, but Rosie reassures him that he looks really nice. Susan receives a call from Peter asking her to go to dinner with him, but she tells him she's seeing someone-her husband! She and Libby beam at one another as she finishes the call. Rosie goes in to the pub and immediately tells Lou she's disappointed in him- for losing his ethics and being 'unscrupulous' in making money because he's organising the thing with Nina. She's taken aback when he says he doesn't have to offer an excuse as Connor and Nina came to him asking if they could stage a benefit for Michelle's trip and although she says good for him, it's cleared up, she just wanders off saying an embarrassed goodbye. Connor breaks the news to Michelle that he has a surprise planned, as he can't risk keeping a secret from her. She's not as thrilled as he expects and explains it's because she wants him to feel she trusts him. He says he doesn't want to take any chances, as he doesn't know how he's going to survive the long separation. Lyn's still flapping over Michelle needing a whole new winter wardrobe when Rosie arrives and tells her and Joe that Gino's Camelot was a great box-office success. They both congratulate Joe for the contribution his work on the set made and tease him because Gino's now planning to do Oklahoma, but he goes a bit cool and says detachedly that he's going to the garage. Lyn mentions that if the garage were female she'd have grounds for divorce, to which Rosie replies that she sometimes thinks that the male species works in mysterious ways. 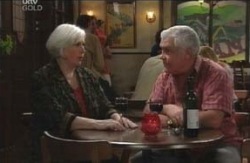 Lyn queries 'Harold's dating exploits?' and suggests 'a cuppa'. Rosie tells Lyn she finds it ridiculous that Harold doesn't put a high value on himself and that he's unlikely to meet a woman he deserves because of the 'kind of woman' who uses such a service. Lyn asks her if the kind of woman she has in mind is someone more like herself perhaps-assuming she were not attached, of course. Rosie says she and Harold have more in common and Lou and she are more like opposites. Lou's more challenging, while Harold's like having a comfortable rest in an armchair-the trouble is she likes them both. When she points out that she's a minister and a counsellor, Lyn replies that she's a woman too. Rosie goes on to say that she doesn't understand herself at all as both men are very dear to her and she's not only been treating them both badly but she's also been trying to stop Harold finding happiness with someone else. Connor thanks Libby for the help with the letter and tells her she's a very good teacher who has turned his life around. Susan is impressed and says now she should be observing Libby, so Libby suggests she come and watch her on her rounds at the high school. Susan is reluctant to face the students' reactions, but agrees to let Libby ask if it's possible, seeing it as a 'challenge'. Glenn Wheatley tells Nina it's obvious Connor has made a great impression on her but when she says that he has no contract and was just helping her out she agrees that Glenn can be her manager. She's enthusiastic until he says he has to contact her parents as she's a minor- when she suddenly says she can't go ahead with it and has to leave. As they say goodbye, Rosie's still talking to Lyn about what to do about Lou and Harold, other than just let things ride. Lyn, however, is very distracted by loud music from the nearby garage. They both wonder what on earth is going on and Rosie goes off leaving her to it. Lyn lifts the door to the garage and to her amazement, finds a number of men including Connor playing the drums and Joe jigging along to the music. He turns and sees her, but she says nothing, just pulls the door back down and goes off with a very perturbed look on her face. Harold greets Rosie with a compliment and she comments on his very cheery manner. When she suggests it's because he's relieved he's finished with the agency, he answers that he's met a most remarkable woman and had a wonderful time. Her name's Ruby, they have lots and lots in common and he thinks he's met someone special. Rosie says with a weak smile 'That's wonderful, Harold'.